Traditionally, coconut was grown for edible oil. It served as an ingredient for various industrial applications too. The changed food habits and availability of other cheaper edible oils both in the edible and industrial sectors, however, have brought out a drastic decline in the use of coconut oil in these areas. During the last few years, on account of heavy imports of cheaper vegetable oil, especially of the Palmolein, the price of coconut oil has been depressed despite the large-scale price support operations undertaken. The Price Support Scheme could not make much impact in pushing up the price level and was not beneficial to the farmers as expected. In this context, it was realized that diversification of coconut derived products and value addition could only help the coconut growers in getting remunerative prices. The coconut crop has also been affected by severe pests and debilitating diseases like root-wilt, ganoderma wilt, Thanjavur wilt and Tatipaka disease. 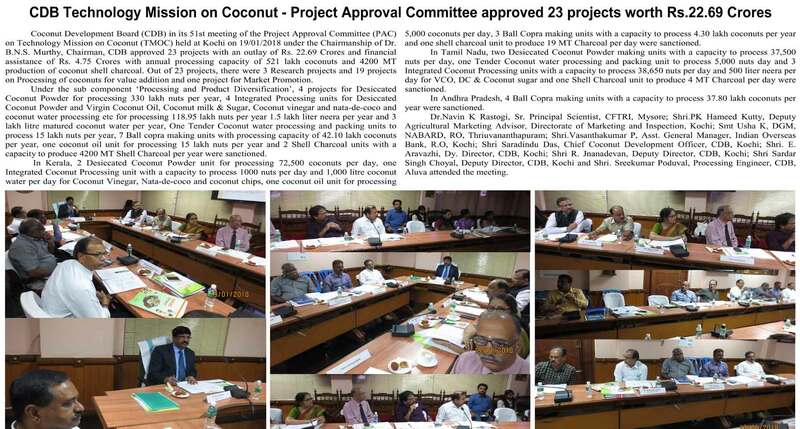 It was realized that a major initiative should be started towards controlling the pests and diseases in coconut to improve its productivity and promote product diversification on better value realization from various coconut products. This will help the small and marginal farmers who depend on coconut for their livelihood to realize better returns. In this context to protect the interest of the coconut growers, the Prime Minister announced launching of Technology Mission on Coconut. The Mission should converge and synergize all the efforts through vertical and horizontal integration of existing programmes and address the problems and bridge the gaps through appropriate programmes in Mission Mode to ensure adequate, appropriate, timely and concurrent action. This would help develop a mechanism which makes coconut farming competitive and ensures reasonable returns. to promote economically desirable diversification and value addition to generate skilled employment. mission approach is to evolve an approach for technology support which shall have synergy and convergence to address the existing gaps. existing schemes of Coconut Development Board and other institutes will continue with existing pattern and shall be converged in a manner that vertical and horizontal integration are achieved. issues which have not been addressed in existing schemes to meet the challenges. issues relating to development of technologies for management of insect pests and disease affected gardens, product diversification and market promotion, its demonstration and promotion for adoption. Capacity building and participatory planning and implementation. Integrated insect pest and disease management. Quality, Quantity and Productivity Improvement. Facilitating Credit Availability and Management. Socially Acceptable and Ecologically Sustainable Schemes leading to large scale adoption and long- lasting effects. Poverty Alleviation Linked with Sustained Natural Resource Management through judicious management of existing land use. Post-harvest Processing, Product diversification and Value addition. Equitable Access of People to benefits and equitable sharing by actually involving people at all levels during the project implementation, thus ensuring the evolution of a proper usufruct sharing mechanism for them. Identification of root wilt disease free palms in the midst of disease affected gardens in 8 Districts of Southern Kerala and subjected to serological /ELISA tests and making use of these palms for seed production for raising quality seedlings. Identification of natural microbial antagonistic agents against eriophyid mite. Large scale synthesis of pheromones against red palm weevil and mass multiplication of pheromones; etc. Any other aspects of insect pest and disease management. 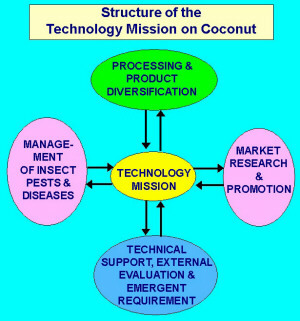 Development of technology for insect, pest and diseases which are contrast to coconut products. Technology available outside the country could be imported with cost. Through improved cropping /farming systems. Through improved cultural practices including nutrient and water management. Demonstration of all the proven technologies on management of insect pests and diseases. Registered cooperative societies/Individuals/ Group of farmers. Any institution having capability to demonstrate technologies. Technologies developed at laboratory level shall be field tested at pilot plant level to assess the technical and economic viability of the technologies. Technologies shall be transferred through demonstration and training of entrepreneurs in the appropriate areas. Any technology available outside the country and could be imported. 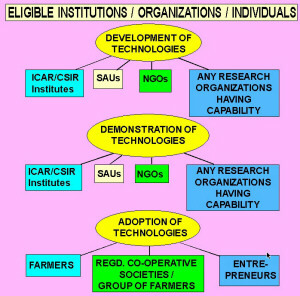 Any institution having capability for conducting research. Review the present situation of coconut development in particular area / State. Develop primary/secondary data of various aspects on coconut. Identify constraints and suggest their remedial measures. Develop short term and long term strategies for systematic development of coconut. Provide consultancy services, expert services & establishing labs etc. in pursuance thereof. All other aspects related to promotion and utilization of coconut products in India and outside. Technology available outside and has potential. Assessment of consumer preference, assessment of value added products and trend analysis. Awareness campaign on health aspects of coconut products. Providing support for establishment of parlours for coconut products, media support, literature, participation in exhibition / trade fairs, etc. within and outside the country. All the Govt. agencies, NGO’s, Registered cooperative societies and individuals. 100% of the cost of project limited to Rs. 50.00 lakhs for ICAR(CPCRI)/ State Agricultural Universities/State Deptt. of Horticulture/Agriculture/and cooperative sector. 100% of the cost limited to Rs.25 lakh projects to ICAR (CPCRI)/ State Agricultural Universities/State Deptt. of Horticulture/Agriculture/other related public sector units/Registered cooperative societies. 50% of the cost for individuals / group of farmers/NGO’s, private companies limited to Rs.10 lakh. 25% of the cost of technology adoption. 25% of the cost in case of group of farmers/ NGO’s/other organizations. 100% of the project cost limited to Rs.75 lakhs for all the Govt. institutions and cooperative societies. 100% of the cost to all the Govt. institutions and cooperative societies. 50% of the cost for the NGO’s, Individual entrepreneurs and other organizations. Back-ended credit capital subsidy limited to 25% of the cost not exceeding Rs.50 lakhs for NGO’s, Individual entrepreneurs and other organizations (As described in Annexure III and paras in other conditions). 100% of the cost limited to Rs.25 lakhs for Govt. agencies and cooperative societies. 50% of the cost limited to Rs.12.50 lakhs for Individuals, NGO’s and other organizations. 50% of the cost limited to Rs.10 lakhs for NGO’s and private institutes. Financial institutions will furnish a very brief profile/fact sheet of the project alongwith a copy of sanction letter and release of 50% of term loan indicating the following details to the CDB HQ at Kochi. Other relevant information, if any. Back-ended capital investment subsidy per project shall be provided under the scheme to these projects which are found technically and financially viable. Subsidy would be sanctioned and released under the scheme on the pattern as approved by PAC. After receiving the sanction letter and release of 50% of the loan, 50% of the subsidy amount will be released to Financial institutions in advance for keeping the same in the Subsidy Reserve Fund Account of the concerned Borrower, to be adjusted finally against loan amount of the bank on completion of the project. Upon completion of the project, the concerned Financial institutions would inform CDB that the project has been completed within the over all guidelines of CDB and shall make a request to CDB for joint inspection of the project, in the presence of the promoter. The remaining 50% of the subsidy amount would be disbursed to the NABARD/Bank/FI/ NCDC, after the satisfactory report of the inspection of the project. Financial institutions as the case may be, would submit to CDB utilization certificate of the subsidy released by CDB. The subsidy released by CDB to Financial institutions (FIs) on behalf of the individual units that are sanctioned assistance will be kept in the separate account. The adjustment of subsidy will be in the separate account. The adjustment of subsidy will be on the pattern of back-ended subsidy. Accordingly, the full project cost including the subsidy amount but excluding the margin money contribution from the beneficiary would be disbursed as loan by the banks. The repayment schedule will be drawn on the loan amount in such a way that the subsidy amount is adjusted after the bank loan portion (excluding subsidy) is liquidated. The subsidy admissible to the borrower under the scheme will be kept in the Subsidy Reserve Fund A/c – borrower-wise in the books of the financing banks. No interest should be applied on this by the bank. In view of this, for the purpose of charging interest on the loan, the subsidy amount should be excluded. The balance lying to the credit of the Subsidy Reserve Fund A/c. will not form part of Demand and Time Liabilities for the purpose of SLR/CRR. Suitable instructions issued in this regard by the RBI from time to time would be followed. With a view to achieve the stipulated objectives, the district authorities, other concerned states/UT/Central Govt. Organizations, Agencies, Financial Institutions and Private Associations, etc. may encourage the networking of their activities/schemes with the CDB. The subsidy would be released through the Financial Institutions/Banks on the lines suggested in the proceeding paragraphs. Techno Economic Feasibility Studies for development of coconut in States/UTs/Belts/Zones etc. Market Studies/special problems/Area Commodity based study/other aspects. Expert Services for project identification, formulation, implementation, monitoring & evaluation etc. Multi-disciplinary and specific studies as approved by PAC. Study would be conducted through empanelled consultants. The panel of consultancy firms would be updated after every three years. Consultants should have capability, as may be evident from their past experience in similar work in agriculture/horticulture/post-harvest management. The consultants must have required infrastructure for taking up consultancy as per job requirements. The consultants must have expertise and experience in the field of horticulture, financial management, project formulation, project evaluation, monitoring etc. Preference would be given to the such consultancy firms, who have experience in conducting studies in a similar agro-climatic conditions. The consultancy firms should be registered, and it should be multi disciplinary, having minimum experience of 3-5 years. Individual consultants or subject matter specialist like horticulture/ agriculture experts, economist/ management/ legal/ personnel/ financial/ marketing/ information-technology experts can be engaged for specific activities, where the expertise can be engaged for specific activities, where the expertise of an individual is required. The selection of experts for specific/multi-disciplinary studies shall be finalized by the project appraisal committee keeping in mind their known professional in the field. Procedure for empanelment of consultancy firms. Wide publicity would be given through mass media for calling the offers. from consultancy firms for empanelment. Based on criteria, a panel of consultancy firms would be prepared by PAC. Multi-disciplinary and specific studies would also be entrusted to registered bodies having a minimum experience of 3 to 5years and Individual experts in the field of horticulture/ agriculture/ economics/ finance/ legal/ personnel/Marketing/information technology etc. by CDB for specific activities. Consultants would send their detailed offer taking into consideration scope of work/term of reference within prescribed period. Consultants would be required to give offer in-respect of Technical & financial aspects. Offers would be scrutinized by the Board for consideration of PAC. Consultants would present their case in person before the PAC on the date & time to be decided by the Board. The study would be carried out in accordance with the scope of work. Period of study would be decided by the PAC on case to case basis. Study would be awarded by the Board on the recommendation of the PAC. Above mentioned procedures shall not apply in the case of selection of experts by the PAC. Draft report would be submitted to the consultants within the prescribed time. Consultants would also present the study undertaken through Slides, etc. before the PAC & concerned sponsoring organization. Comments of PAC/Sponsoring organization would be included in the study report. Consultants would coordinate for organizing the presentation of the report. Consultants would require to submit two copy of Draft Report and 20 copies of Final Report duly bound along with computer floppy. The project proposals may have vertical or horizontal integration. A Signboard at the site “CDB Assisted Project” will also be exhibited. CDB reserved the right to modify, add and delete any term/condition without assigning any reason thereof. CDB’s interpretation of various terms will be final. As and when required, pre & post inspection would be undertaken by CDB representative(s) to find out the physical & financial progress. Application for Grant for Development of Technologies/Market Research and Promotion under Technology Mission on Coconut. Application for Availing of Financial Assistance for Demonstration and Adoption of Technologies on Insect Pest Management. 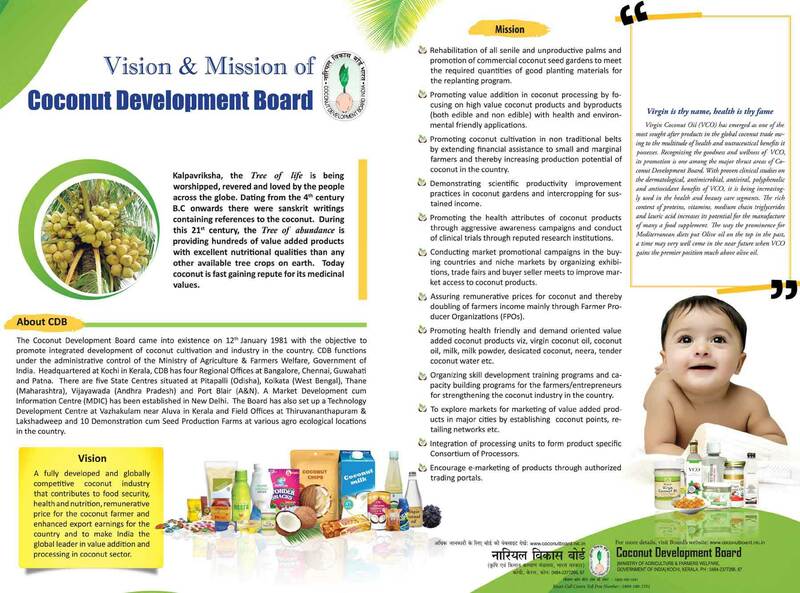 SCMS Institute of Bioscience and Biotechnology Research & Development (SIBB-R&D), Kalamassery, Cochin has shown keen interest to be associated with the Coconut Development Board for development of coconut based products utilizing their existing infrastructure and technical competence. High quality research in biotechnology & bioscience for the promotion of Biotech Industry at National and International level are being undertaken by the Institute. Dr.C.Mohankumar, Director, Dr.Balachandran, consultant and scientists from the Institute had a preliminary discussion with Shri.T.K. Jose IAS, Chairman and other senior officials of the Board on 17.10.2011 in this regard. SIBB would be submitting projects for development of value added coconut products shortly to CDB for assistance under Technology Mission on Coconut (TMOC) programme of CDB. Applications are invited from prospective entrepreneurs for setting up /modernizing / expanding coconut processing units under Technology Mission on Coconut. 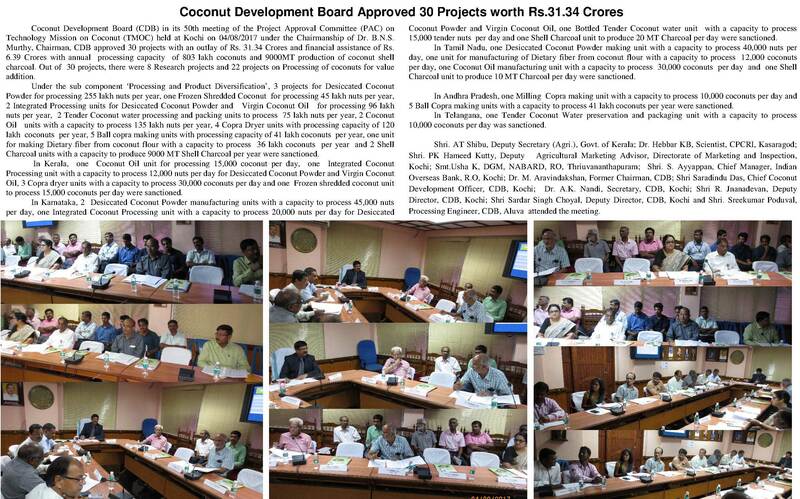 Financial assistance @ 25% of the project cost limited to a maximum of Rs.50 lakhs is extended as credit linked back ended subsidy for setting up of coconut processing units for production of value added coconut products. Modernization and expansion of existing processing units will also be eligible for assistance. The detailed project for seeking assistance for setting up coconut processing unit should be submitted through the Financial Institution, willing to sanction a minimum of 40% of the project cost as term loan for Private entrepreneurs and 25% term loan for Co-operative societies. Packed tender nut water, coconut water based vinegar, Desiccated coconut powder, defatted coconut powder, coconut cream, coconut milk powder, Packed and Branded coconut oil with Agmark standards, Virgin Coconut Oil (VCO), Coconut chips, coconut jaggery, snow ball tender coconut, shell powder, shell charcoal, activated carbon, shell/wood based handicrafts, coconut wood processing units, copra dryer, integrated processing units etc. and such other new and innovative coconut based products, which are backed by commercially viable technologies will be considered for granting financial assistance. Financial assistance is also provided to manufacturers for market promotion of coconut products through brand publicity through electronic media including website, print Media, Parlours, Kiosks, Warehouse, undertaking activities like buyer-seller meet, exchange of delegations, Participation of Exhibitions/Fairs/ Melas, printing of Leaflets, Pamphlets, Brochures, Posters, display of coconut products at Air Ports/Railway Stations and erection of hoardings etc. on the basis of approved proposals . The financial assistance is 50% of the project cost limited to Rs.10 lakhs for individuals and Rs.25 lakhs to co-operative organisations on reimbursement basis. Entrepreneurs requiring external expertise for preparation of project reports may contact the Board’s empanelled consultants, M/s. GSPU and Associates, Sasthamangalam, Thiruvananthapuram, (Phone 0471-2723427, 09349336982), Shri. Job K.T, Assistant Professor, Centre for management Development, Thycaud, Thiruvananathapuram (Phone: 91471-2320101), Shri. V.Venkitachalam, Project Consultant, Panampally Nagr, Cochin (Phone: 0484 -2319841, 9446087841), M/s. Datamation Consultants Pvt. Ltd., Hasanpur, New Delhi (Phone: 91-11-43038800, 43038802), Dr. P.M.Mathew, Director, Institute of Small Enterprises and Development, Cochin (Phone: 0484 -2809884, 2808171) and M/s. Solutions and Services in Management and Development (SSMD), Manorama Junction, Kochi (Tel/Fax -0484 – 2318383). The project proposals completed in all respects may be sent to the Chairman, Coconut Development Board, Kerabhavan, Kochi 682 011. The Coconut Development Board and Central Food Technology Research Institute (CFTRI), Mysore have developed a technology for production of Virgin Coconut Oil and Dietary Fibre. Virgin coconut oil is made from fresh coconut meat by wet milling process (cold processing). Coconut milk is fermented and then by mechanical process, water is separated from oil. No heating or application of sunlight or dryer is done for the process. The virgin coconut oil is free from trans fatty acid, high in medium chain fats (MCFA) known as lauric acid, which is identical to special group of fats found human breast milk and also rich in vitamin-E. The technology will be transferred to entrepreneurs having a sound financial background and experience in production and marketing. Interested entrepreneurs may apply to the Board in the prescribed application form which is downloadable from the link given below. The selected entrepreneurs will be required to pay a technology transfer fee of Rs.50,000. The Board reserves the right to reject all or any of the applications received.